There are few things that scare a kid more than the strange creatures and happenings in the world of Oz. I mean, melting witches, hologram wizards, and do I even need to mention detachable mannequin heads (thank you, Return to Oz, for several decades of nightmares)? So it wasn’t without cause that I worried about how Wicked Flying Monkeys might traumatize a new generation of children. Well I’m glad to say that fearsome as said flying monkeys may be, this chirpy animated movie won’t force your kids to retreat under the covers every night. Instead, it delivers a message about standing up for yourself and finding the strength to do so because of, and not in spite of, your quirks and differences. The animation is serviceable, not great, and the characters are generic, boxy creations, but it’s a fun diversion that delivers some touching emotional moments. Our protagonist is little Ozzy, an insecure winged primate who doesn’t know how to fly. He floats around with the help of a balloon tied around his waist, much to the embarrassment of his father, Goliath. Since Goliath is also the leader of the flying monkey guards, Ozzy’s inability to perform basic flying monkey skills gets in the way of a more tender father-son relationship. That bond is put to the test when the Wicked Witch, Evilene, turns Goliath into a chicken after he tries to defend his son. The green lady, you may recall, came to a sad, wet end in the Wizard of Oz, but in this movie, we find that the Good Witch, Glinda, has revived her and given her a second chance. Worried that her sister might use her powers to terrorize lost farm girls again, Glinda has locked all of Evilene’s powers into a magic broom to be guarded by the kings of Oz – the Cowardly Lion, the Tin Man, and the Scarecrow. However, Evilene, being evil, orders her minions to steal the broom back. The mission goes a little haywire, but Evilene gets her hands on the broom long enough to cast spells on the three kings and send them scattering in different directions. 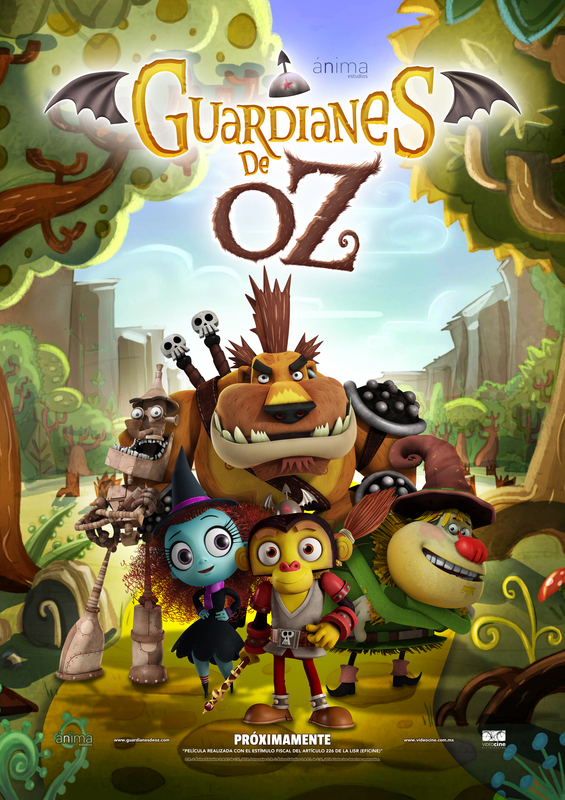 Like Dorothy before him, Ozzy takes an adventure that teaches him to face his fears. The timid monkey must find the three kings and bring them back to defeat Evilene. His journey leads him to Gabby, Glinda’s niece and witch-in-training. Unfortunately she’s very much a witch in training and has accidentally frozen her aunt. Unable to seek Glinda’s help, he’s left to his own devices. If he doesn’t accomplish his mission, Oz will be lost to Evilene and his dad will be chicken soup. Even in this magical land, people, well monkeys, are constrained by social norms too. Ozzy has no stomach for wickedness, and if it were up to Goliath, he would probably just let his kid float around with a balloon. But that’s just not the way things are. It takes our little hero to show that kindness and tenderness are compatible with strength and courage, a worthy message and one I want stamped into every child’s brain. Posted in Mexico, Western movie reviews and tagged animated movie review, family films, fantasy films on July 9, 2017 by limmer13.